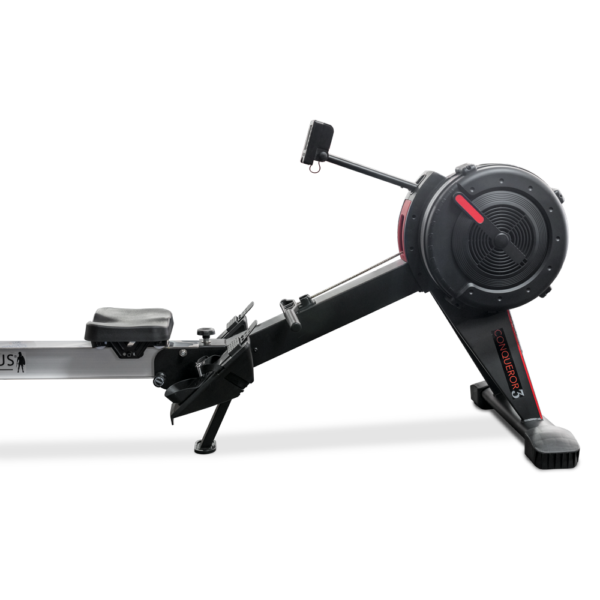 Conquering the Concept of the rowing machine. 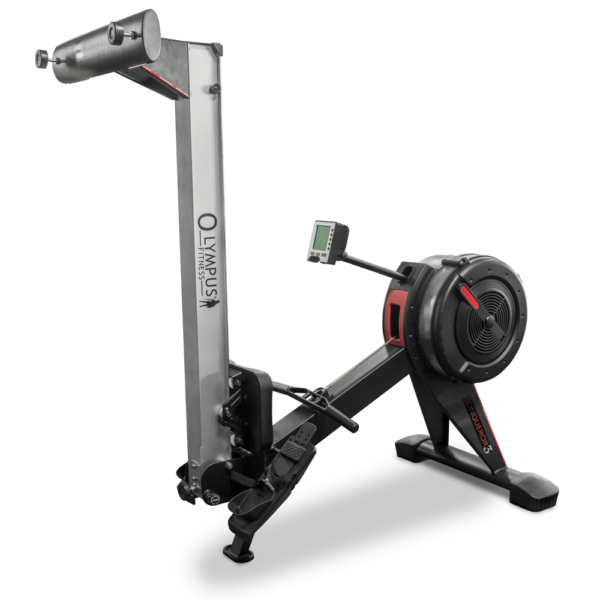 The Rowing Machine CONQUEROR3 by OLYMPUS® is an elite Commercial grade model. It is firmly positioned to compete with and ‘rattle’ the Commercial Rowing Machine market. OLYMPUS® has unashamedly dissected the best commercial rower, studying all the good features, adding to them and creating the very impressive CONQUEROR3. 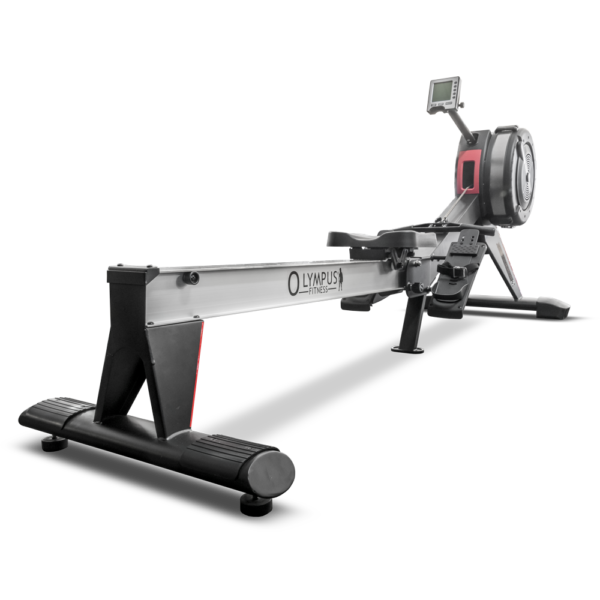 Let us show you what CONQUEROR3 has over CONCEPT2 and see if you qualify for the ‘Promotional Rebate Offer’. Resistance Flywheel and Damper. 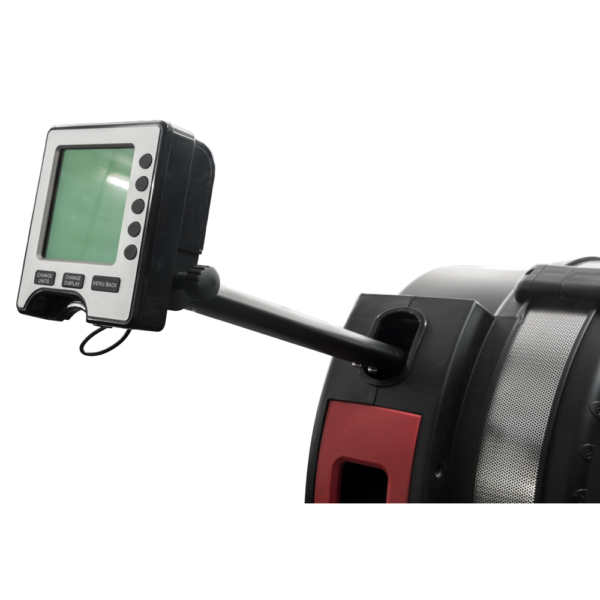 The OLYMPUS® CONQUEROR3 Air has an advanced design fly wheel and this combined with the spiral damper allows resistance to be applied quickly and smoothly via increased air flow to the fly wheel. Seat Height. 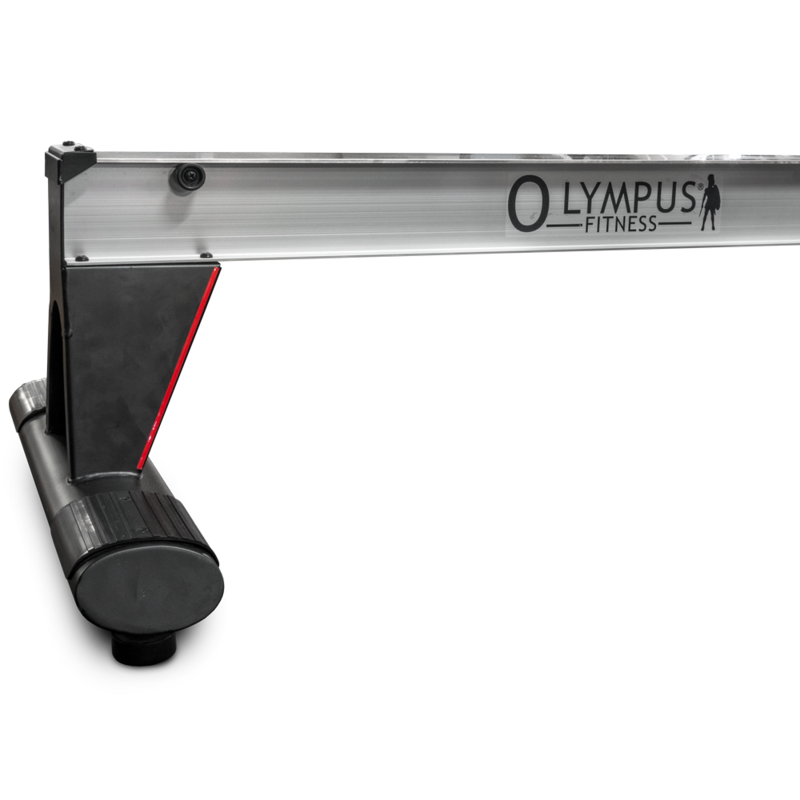 OLYMPUS® has settle for a seat height of 45cm being the best of both worlds and the most popular height for most users. To accommodate users requests for a smoother seat travel a Stainless Steel plated cover has been fitted to the seat rail. Superior Console. Large 4.5″ FSTN Matrix Display, ARM Program Chip; Time, Distance, Speed, Pace, Calories, Watts, Pulse, Multi Training options, (Just row and select workouts). Five (5) display options for each training. USB connection available to upload workout data to computer. Console automatic memory keeps data up to one week. Storage and Movement. When not in use the CONQUEROR3 is easily up-ended on to its nose, occupying a small footprint of 90cm x 70cm. 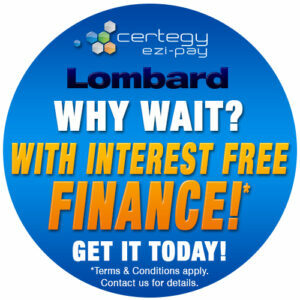 Alternatively the rail has a quick-release (no tools required) mechanism and can be quickly hinged up if required. The front castor wheels allows for easy movement when made up. 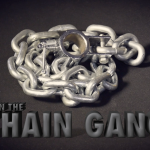 Chain and Housing. To achieve a smoother movement and reduce the amount of maintenance required a Nickel plated chain has been fitted. To house and protect the Nickel chain OLYMPUS® opted for a fully enclosed cover. 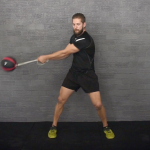 Frame/Leg Stability. The main seat-rail frame is 100mm x 100mm Aluminium with Stainless Steel top cover this combined with the impressive front and rear feet/Stabilisers offers a solid/stable foundation for any user. Commercial design Footrest and Handle. Heavy-duty adjustable footrests to fit any size foot. Ergonomic designed handle has the optimal shape for a comfort and stress free grip. 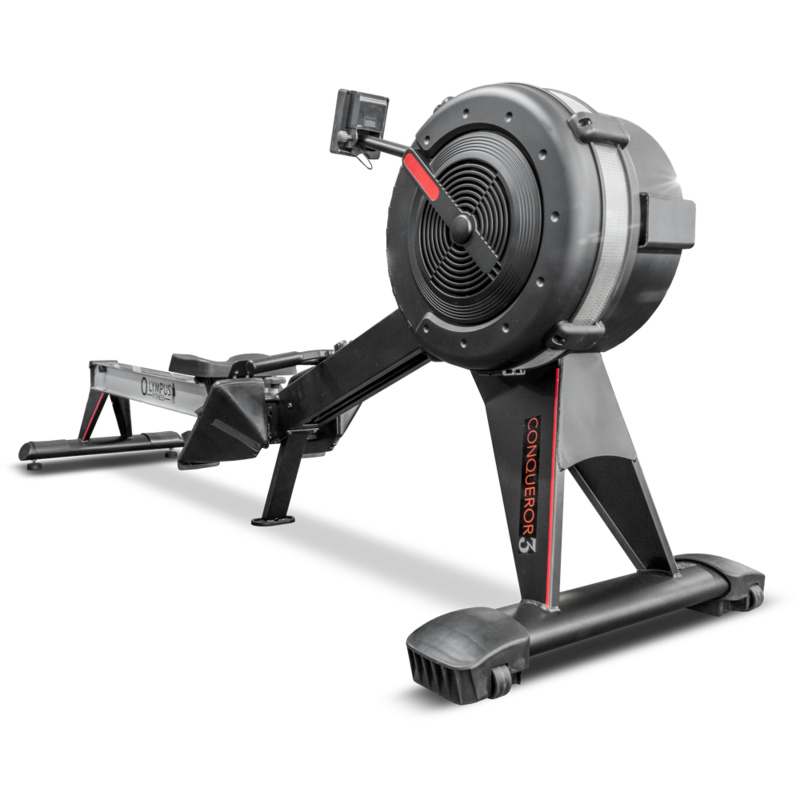 Rowing Machine CONQUEROR3 Key Benefits. 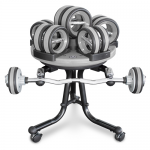 Smooth Air resistance for a low impact effective workout. Load control via Fly-wheel dampener. Large adjustable foot strap feet pedals for a tight fit. 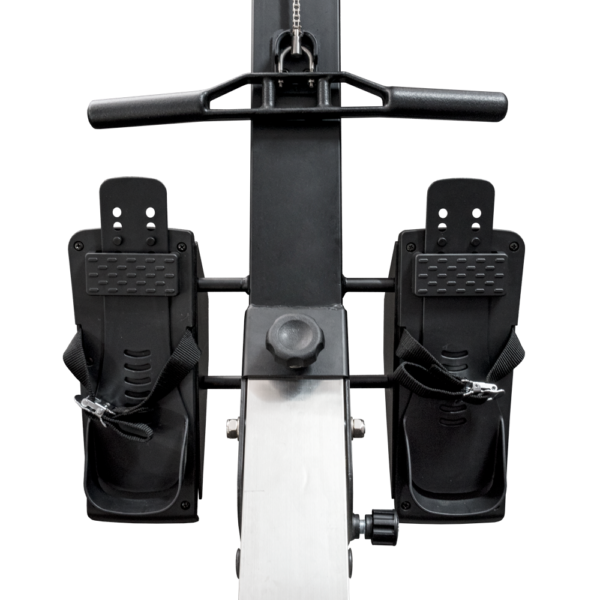 Superior Console, 4.5″ FSTN Matrix display for tracking every workout and Heart rate chest strap built in receiver. 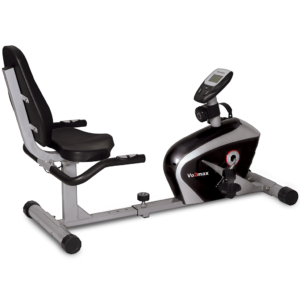 Matrix monitor with feedback: Time, Speed, Distance, Strokes, Total strokes, Watt, Calorie, Recovery, programs, load, Heart rate. Foot strap with easy adjustment of straps. Built in chest strap heart receiver. Folding design for easy storage. Transport wheels for easy transportation. 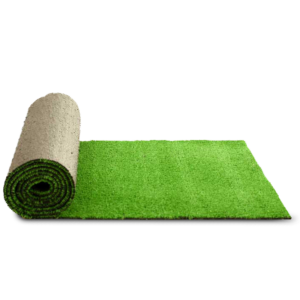 Heavy duty user rating of 220kg. Assembled dimensions (set up for use) L 2460mm x W 790mm x H 1060mm. Folded when not in use, L 1370mm x W 460mm x H 2065mm. Cartons dimension: Carton 1. L 1460mm x W 470mm x H 660mm. Carton 2. L 850mm x W 840mm x H 285mm. 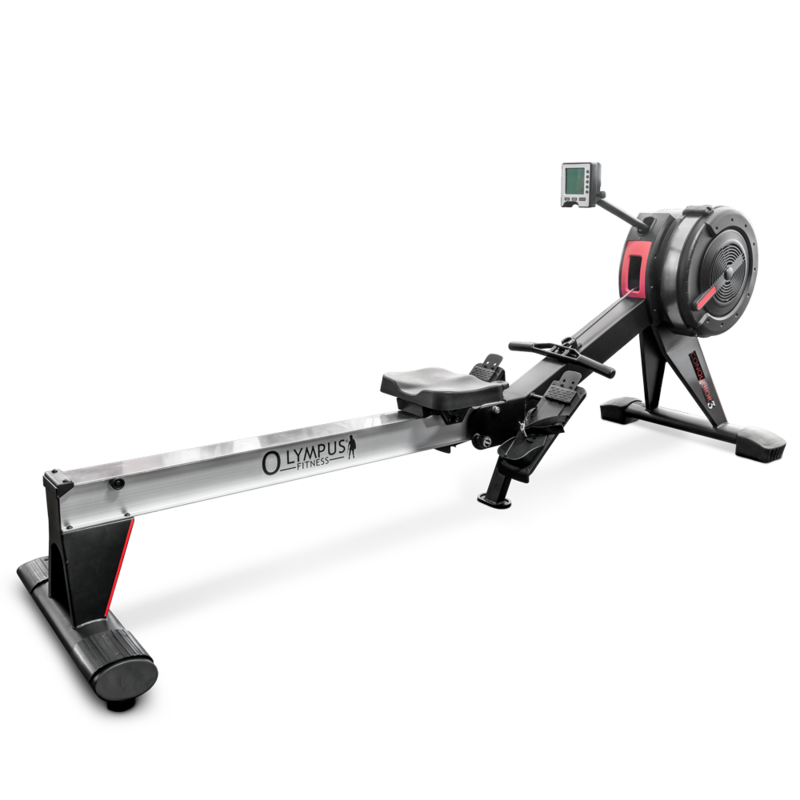 Hey buddy, The conqueror 3 is a great rower. Compared to the concept 2 it has a much sturdier frame & rail but is still light enough for myself or any of my clients to move around & store. 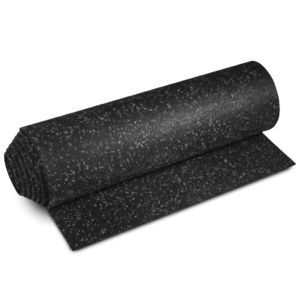 It is smooth and has the perfect tension on any of the 10 settings. 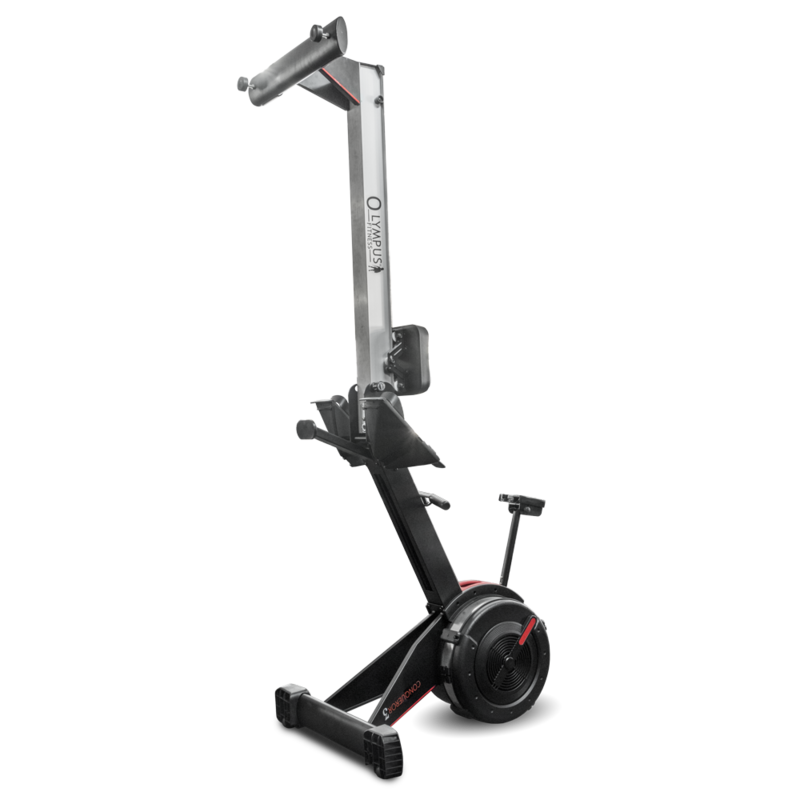 I think the 3rd leg, which the concept 2 doesn’t have creates a much sturdier foundation and will only add to it’s longevity. It has no dramas working for an hour straight in any of my group classes.